T15 recognises the p85 beta subunit of bovine PI 3 kinase. It does not cross react with the p85 alpha subunit. Balculovirus expressed (Recombinant) bovine P85 beta subunit of PI 3 kinase. Lysates of SF9 cells infected with baculovirus expressing p85 beta. This antibody is purified IgG prepared by affinity chromatography on Protein G from tissue culture supernatant. Our Abpromise guarantee covers the use of ab28356 in the following tested applications. Regulatory subunit of phosphoinositide-3-kinase (PI3K), a kinase that phosphorylates PtdIns(4,5)P2 (Phosphatidylinositol 4,5-bisphosphate) to generate phosphatidylinositol 3,4,5-trisphosphate (PIP3). PIP3 plays a key role by recruiting PH domain-containing proteins to the membrane, including AKT1 and PDPK1, activating signaling cascades involved in cell growth, survival, proliferation, motility and morphology. Binds to activated (phosphorylated) protein-tyrosine kinases, through its SH2 domain, and acts as an adapter, mediating the association of the p110 catalytic unit to the plasma membrane. Indirectly regulates autophagy (PubMed:23604317). Promotes nuclear translocation of XBP1 isoform 2 in a ER stress- and/or insulin-dependent manner during metabolic overloading in the liver and hence plays a role in glucose tolerance improvement. Belongs to the PI3K p85 subunit family. The SH2 2 domain is required for interaction with FBXL2 and PTPN13. Phosphorylated in response to signaling from activated receptor-type protein kinases (PubMed:19690332, PubMed:20068231). Dephosphorylated by PTPRJ (PubMed:18348712). Dephosphorylated at Tyr-655 by PTPN13. Phosphorylation of Tyr-655 impairs while its dephosphorylation promotes interaction with FBXL2 and SCF(FBXL2)-mediated polyubiquitination (PubMed:23604317). Ubiquitinated. Polyubiquitination by the SCF(FBXL2) complex probably promotes proteasomal degradation of PIK3R2. 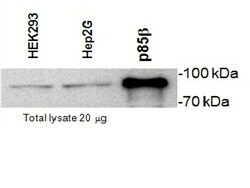 Western Blotting of HEK293 and HepG2 cell lysates with Mouse anti Bovine PI-3 kinase p85 subunit beta (ab28356), recombinant p85ß is included as a positive control. Publishing research using ab28356? Please let us know so that we can cite the reference in this datasheet. There are currently no Customer reviews or Questions for ab28356.